This is for kids who are in those awesome junior high years! Our program draws from several martial arts including Taekwondo, Brazilian JiuJitsu, Krav Maga, and XMA weapons! This is a comprehensive training system focusing on both the physical and mental. 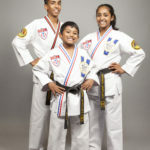 Perfect for teens who are looking to have a great outlet as well as learn some real martial arts skills. Fun, Focus, Fitness! The Teen Titan program is the best thing your teenager will do this year! Brazilian JiuJitsu – Grappling, submissions, takedowns. The gentle art. XMA – all the cool weapons! Chucks! Bo Staff! Combat Stick! There is never a bad time to get started! Click or call and come in for a free class! No obligation. Get your teenager into a positive life changing experience!